Other than at the main dining room and buffet or via room service, where else can I get a meal or snack on my cruise ship? While the main dining room and buffet will likely be the biggest restaurants on your cruise ship, you will find additional dining options that vary by line and ship. Some of these restaurants are free of charge, such as a poolside grill, a casual pizza place or even an open-all-night comfort food venue. Other restaurants charge a fee. Those range from venues serving ethnic food to high-end gourmet establishments backed by Michelin-starred chefs. Some ships have exclusive restaurants only accessible by passengers booked in suites or spa cabins. Other cruise ships, such as Quantum of the Seas and those in Norwegian's fleet, do not have any traditional main dining rooms and instead offer a variety of smaller cuisine-themed venues, both for free and for a fee. How much do these restaurants cost? Like hours of operation, dining surcharges are all over the map. Food in specialty restaurants is sometimes included in your cruise fare; examples include Carnival's BlueIguana Cantina and Fat Jimmy's C-Side BBQ, and Princess' Alfredo's Pizzeria. 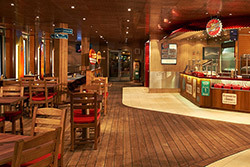 Some cruise ship restaurants price items a la carte, such as Royal Caribbean's Michael's Genuine Pub and Izumi Japanese Cuisine. But most cruise dining venues have a flat-fee surcharge, ranging from $5 (Celebrity's The Porch) or $10 (Holland America's Canaletto) to $75 (Disney's Remy). Most fall into the $20 to $45 range. Do these restaurants only serve dinner, or are other meals available as well? The majority of the sit-down, dress-up specialty cruise ship restaurants serve dinner only. Some do offer a lunch menu, usually at a lower price and only on sea days; others offer breakfast but only to the most loyal past passengers and those booked in suites. Casual venues might serve food throughout the day like Johnny Rockets on Royal Caribbean, offer breakfast and lunch like Celebrity's AquaSpa Cafe or serve throughout the afternoon like Carnival's Guy's Burger Joint. Do I need to make a reservation? If so, how do I do that? Every cruise line has its own reservations policy. In general, most sit-down specialty restaurants take reservations; the most casual pizza-by-the-slice or diner-type venues and food counters without specific seating tend to be first-come, first-served. For restaurants that do take reservations, it's always recommended that you book your dining times in advance. Most will accept walk-ins, but the more popular venues will fill up, and you might have a hard time getting a table. If you do want to play it by ear, your best bet is showing up either when the restaurant first opens or late in the evening, on the first night of the cruise (when most people eat in the main dining room) or on a night the ship is still docked in port at dinnertime. Making reservations is easy. Some cruise lines allow you to pre-reserve tables through the "booked guest" section of their website. Once onboard, you can call the restaurant from your in-cabin phone, drop by the venue to make a reservation in person or go down to the reception desk, where someone can usually help you. Some lines with multiple dining venues will set up a reservations area by the front desk. In addition, you can use technology to help you. Certain lines have mobile apps that allow you to make restaurant reservations, while others have interactive display screens where you can view restaurant availability and make reservations. If you do reserve in advance, check with your cruise line to find out its cancellation policy. Some will charge a minimum fee if you cancel within 24 hours of your dining time, and if you book pre-cruise and prepay the cover charge, you will be refunded in either cash or onboard credit, depending on how far out you cancel. Can I eat at a specialty restaurant more than once per cruise? Yes. For the most part, you can dine at any restaurant as often as you like, provided you are able to get a table. The exception would be lines that put a restriction on reservations; these are often lines with only one or two extra restaurants. For example, Oceania only lets passengers in lower-priced cabins make one reservation in each alternative restaurant; passengers in certain suites and higher-priced cabins can make two. Crystal ensures that every passenger can dine once, for free, in its Italian and Asian venues. After that, passengers can dine again if space is available, but they'll have to pay a surcharge for any subsequent visits. Generally, children are allowed to dine in specialty restaurants. Certain ones do designate themselves as adults-only, such as Disney's Remy and Palo. And Celebrity only allows children ages 12 and older to dine in more upscale restaurants, such as Murano. Cruise lines also have differing policies about how much children should pay. For example, Norwegian stipulates that children ages 3 and younger always eat free; children ages 4 to 12 can eat free from a standard menu or half-price from each restaurant's individual kids menu. Royal Caribbean allows children younger than 5 to eat free in its alternative dining venues, and kids ages 6 to 12 incur a reduced fee. How do I have to dress for dinner? Daytime dining on cruises usually does not require a change of dress. More formal restaurants that open for lunch might ask that you not wear shorts or tank tops. At dinner, most cruise ship restaurants tend to be "smart casual" -- casual dresses, skirts or nice pants outfits for women and khakis, button-downs or collared shirts and shoes (not sneakers) for men. Some might require a jacket or tie. On some lines, the general ship dress code carries over into the specialty restaurants, so if it's formal night in the main dining room, it's formal in the other restaurants, as well. In some specialty restaurants, it's formal night every night, and jackets and ties are always required. Again, the most casual dining venues -- like pizzerias and diners -- tend not to care about what you're wearing. Will I be expected to share a table? Unlike in the main dining room, you generally do not have to share a table with strangers in the smaller restaurants onboard. You simply make your reservation for the size of your party, and you'll be seated accordingly. The exception is if a specialty restaurant is nearly full. In that case, you might be asked if you'd rather share a table to get the dining time you prefer or take a less ideal time to get a table for just your party (or not take a reservation at all). 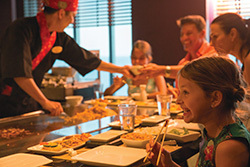 A few places, such as sushi bars or hibachi-style restaurants like Norwegian's Teppanyaki, have shared seating as part of the dining concept. Most onboard restaurants, especially the sit-down venues, can handle special diets by pointing out which menu items fit the bill, adapting dishes or creating a special dish for you. If you have an especially restrictive diet, it's best to look at the menu and meet with the chef or restaurant manager in advance so he can be sure to have a meal that suits your needs. For example, in Disney's Palo, the chefs can make a gluten-free version of the chocolate souffle -- but only with 24 hours' advance notice. Is there any way to save money on restaurant surcharges? Yes! Several cruise lines offer specialty dining packages, which allow you to pay a reduced rate for multiple restaurant reservations on a cruise. Just make sure the package works for you because the cruise line will often stipulate which restaurants and how many reservations in each. In addition, some upscale restaurants offer lunch on select days, usually at a lower fee than dinner. 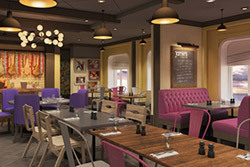 These include Holland America's Pinnacle Grill and Royal Caribbean's Jamie's Italian. Finally, some lines will offer a deal on dining on the first day. For example, Celebrity offers reduced cover charges, and Carnival provides a free bottle of wine. How do I find out which restaurants are on my ship? Cruise Critic's cruise ship reviews list all onboard restaurants in the Dining section. 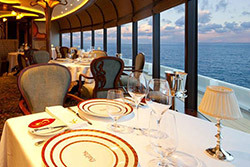 You can also find lists of restaurants on your cruise line's website. Alternately, you can look at a deck plan (on Cruise Critic, on a cruise line website or onboard). How can I learn more about specialty cruise ship restaurants?